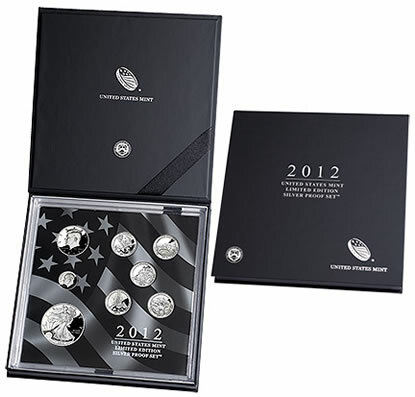 The United States Mint today, November 27, 2012, placed a new limited-edition proof set on sale. Restricted to 50,000 units, each is $149.95. The smaller seven coins are also available within the Mint’s annual Silver Proof Set for $67.95 while the proof Silver Eagle sold by itself earlier in the year for $59.95. Coins with the ‘S’ mint mark originate from San Francisco. The proof Silver Eagle has a ‘W’ mint mark and comes from West Point. With a total silver weight of 2.338 ounces, melt values of the eight coins sum to $79.62 at today’s London Fix silver price of $34.05 an ounce. That equates to a $70.33 premium when subtracted from the set’s 149.95 price. Collectors may place orders online at the United States Mint website found here. Sales are restricted to two sets per household. A $4.95 shipping and handling fee is applied to the shopping cart at check out. Shipping dates were fluid when details of the Limited Edition Silver Proof Set first emerged. The U.S. Mint first indicated shipping would begin in the spring of 2013. The bureau has now confirmed that early orders will start shipping in late December. nice packaging. ugly price. but who cares. i just try two sets. it’s limit. price same with san francisco two coins set at $149.95/set. it contained 2.3382 ounce of silver against SF 2.0 oz. I’m a collector……Not an idiot! I Like proofs at most any price, I can afford. The mirror finish. The relief is awesome. Thanks . Really? Have you people been sleeping this whole year? These coins have been offered for months either individually (eagle) or in the silver proof set and yet you feel there’s value in repackaging the same coins and spending more for that? I’ll bet you people buy from the coin vault all the time since this is the kind of stuff they put out. Serial Poster. He works for the MINT and writes propaganda on sites like this thinking he’s going to convince uninformed sheep to buy this product by the thousands. Just laid off by the DNC, moved back into his parent’s basement, and can’t get a real job. The Liberty Coin Act directs the Treasury director to mint silver eagles. This law was not in place then, but is now. While the Mint may stop minting many silver issues, the silver eagle in bullion form is required. The last time they skipped the proof, congress was quick to remedy to situation. The sixties was a different time and the US silver horde had been greatly diminished (like its’ gold) and caused changes around the world as many nations reduced their silver coin content. Could it happen again? Sure, but the silver eagle would require new legislation instead of ministerial fiat. The price sends me a message that the United States Mint knows that Silver is going to go through the roof. The Government is broke; 16 TRILLION in the hole and failing. When Soros and Paulson go big into metals…something only big money knows, is beginning to happen. All the leaves are brown, and the sky is grey. I went for a walk on a winter’s day. Ahh, give me the good old ’60s over today’s messy world. One could still walk into a bank and actually ask for Morgans and get them. Can you imagine? YES give me the sixties, when collecting was a hobby not a business. You got your coins at the bank and searched for the ones you needed, or your friend needed. Now if i want to collect NP , presedents, NA, I have to buy from a dealer or the mint. You can’t even get a half dollar any more. And the mint spits out so many coins that they have to pay to store them. I’m afraid my hobby is dieing!!! Hey George, Glad to hear your two cents as usual. Keep them thinking. I recall the 60’s with Vietnam, Nixon / Watergate, Runaway inflation and Social unrest w/ burning and looting. And of course there was the biggest issue of the 60’s… going to Clad Coins from 90% Silver. Stuart Wheeler, And your point is? I know you don’t like this set. Where’s Mike Mesak when you need him??? I collect mirror finish proofs and I especially like grouped sets. However, the price of this set is ridiculous! It looks like the mint wants the collectors to pay for all their overhead costs and to cover for money lost due to poor management decisions. Hello from an American living in Germany. Yes, I have ordered the 2012 limited proofset. Annie is right. So it costs more than the sum of the coins in silver proof sets plus the 2012 W Liberty. Have you ever seen a proof set limited to 50,000 sets? Just take a look at the annual 2012 Silver Proof Set selling at unheard of numbers! On Ebay.com, there is one of the limited set selling at the current price $175,00 with a couple of days to go. What’s the belley ache? This set is the shades of the 1999S silvet proof set, still selling for ca. $150,00. Yes, I have this one too. We are living in uncertain times of financial stress. Never forget: Precious metals hold their price. Hello again. Ebay update. On ebay.com,this set passed the $200,00 mark. Still undecided? Current sales, as of 01.10.2013, are 33,370 sets. Hurry!